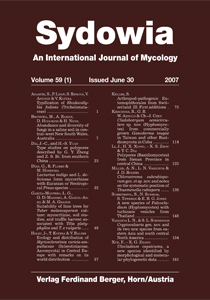 Typification of Rhodocollybia fodiens (Tricholomataceae). Abundance and diversity of fungi in a saline soil in central-west New South Wales. > Dai Y. C. & H. S. Yuan (2007). Type studies on polypores described by G. Y. Zheng and Z. S. Bi. from southern China. Lactarius indigo and L. deliciosus form mycorrhizae with Eurasian or Neotropical Pinus species. Suitability of lime trees for Tuber melanosporum culture: mycorrhizae, soil studies, and truffle harvest associated with Tilia platyphyllos and T. x vulgaris . Ecology and distribution of Myriosclerotinia caricis-ampullaceae (Sclerotiniaceae, Ascomycota) in Central Europe with remarks on world distribution. Arthropod-pathogenic Entomophthorales from Switzerland. III. First additions. Cladobotryum semicirculare sp. nov. (Hyphomycetes) from commercially grown Ganoderma tsugae in Taiwan and other Basidiomycota in Cuba. Polypores from Henan Province in central China. Chlorostroma subcubisporum gen. et. sp. nov. and notes on the systematic position of Thuemenella cubispora. A new species of Falcocladium (Hyphomycetes) with turbinate vesicles from Thailand . > Vasilyeva L. N. & Stephenson S. L. (2007). Cryptovalsia gen. nov. and its two new species from eastern Asia and south central North America. Ulocladium capsicuma , a new species identified by morphological and molecular phylogenetic data.